The theme of the Foyer is the “Life of Man”. On the floor are three mosaics which represent the Earth, “The Spirit of the Soil”, “The Spirit of Vegetation” and “The Spirit of Animal Life”. The three medallions in the ceiling represent “Traditions of the Past”, “Life of the Present” and “Ideas of the Future”. The window arches contain figures to represent the activities of society: the Family, the School, Recreation, Reflection, Beauty and Truth. 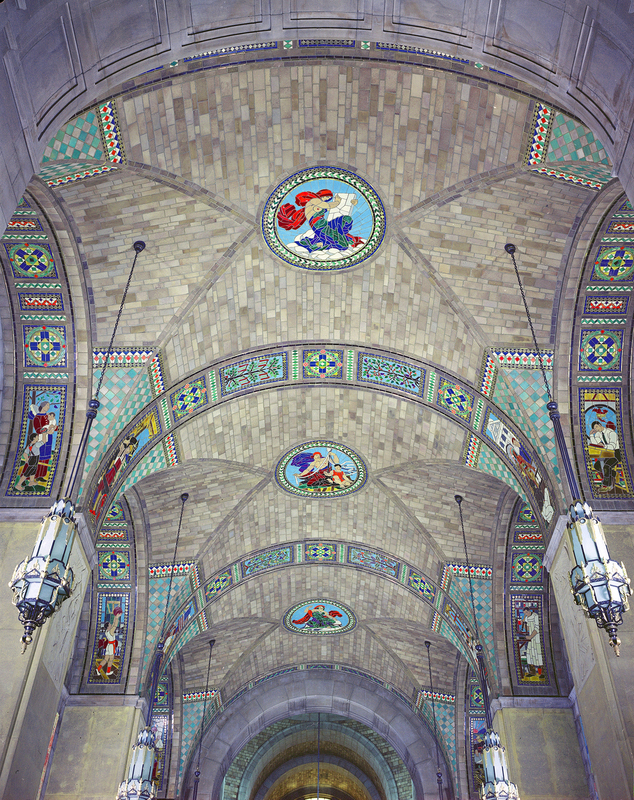 The four inward facing ceiling panels symbolize Law, Labor, Public Spirit and Religion. The six large mosaics on the walls were commissioned to celebrate Nebraska's Centennial in 1967. They are: The United State Survey by Charles Clement, The Blizzard of 1888 and Tree Planting by Jeanne Reynal, The Coming of the Railroad by F. John Miller, and The Spirit of Nebraska and The Building of the Capitol by Reinhold Marxhaussen. The Nebraska Hall of Fame was dedicated in 1961 and includes busts of individuals who have served Nebraska and the nation. Starting in the Foyer, the Hall of Fame continues in the Courtyard Galleries.